Helen and I have lived in the market town of Brecon in Mid-Wales for the past six years, but we were familiar with the town for some years before. When we were house-hunting in 2007 Brecon was high on our list of desirable places and were overjoyed to learn of an ideal property in the town. We bought it, moved in, and began to enjoy life here early in 2008. Since then the old town has more than lived up to our expectations! Now, through a series of photographs revealing typical scenes in the town, we’d like to share our impressions of Brecon with you. Approaching Brecon from the west along the A40. 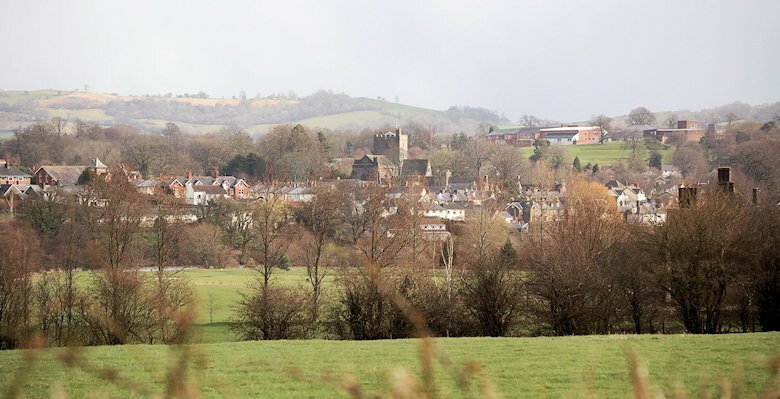 Brecon is dominated by two churches: the Priory Church of St John the Evangelist (now Brecon Cathedral) built in the 11th century on the castle mound above the northwest side of the town, and the 12th century St Mary’s Parish Church, a major landmark in the town centre. The town is sheltered to the south and southwest by the high peaks of the Brecon Beacons (below). The Buckingham Tower of St Mary’s Church rises above the centre of Brecon, while the peaks of Pen-y-fan and Corn Du provide a dramatic backdrop. 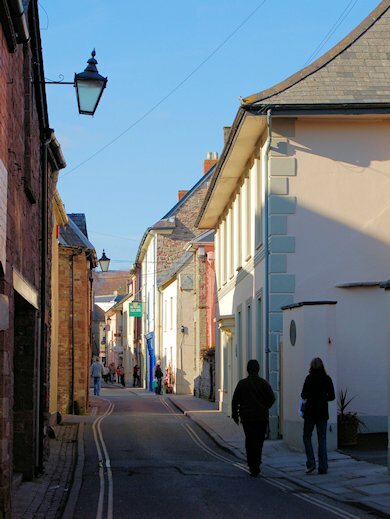 The images that follow are some picturesque and some curious scenes in Brecon’s streets. The Puzzle Tree on the corner of Danygaer, photographed in 2007. 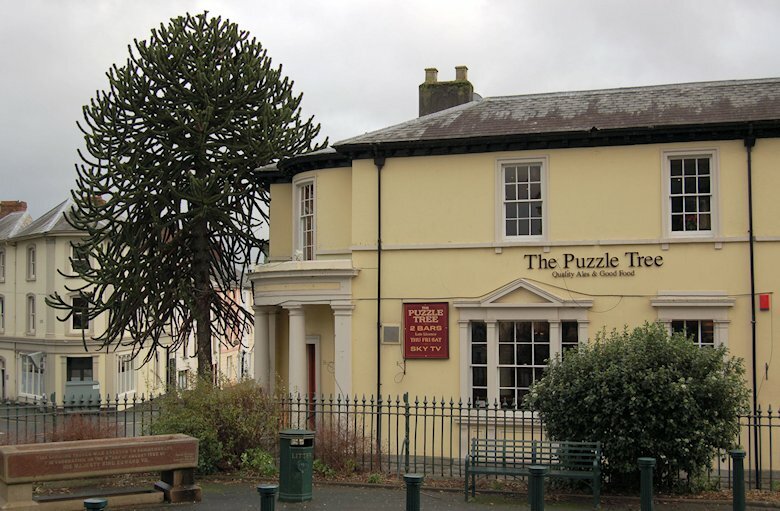 The monkey puzzle tree (above) is a well-known landmark in Brecon. The building alongside was originally a bank but for some years has been a public house initially named The Puzzle Tree but now  called The Bank. 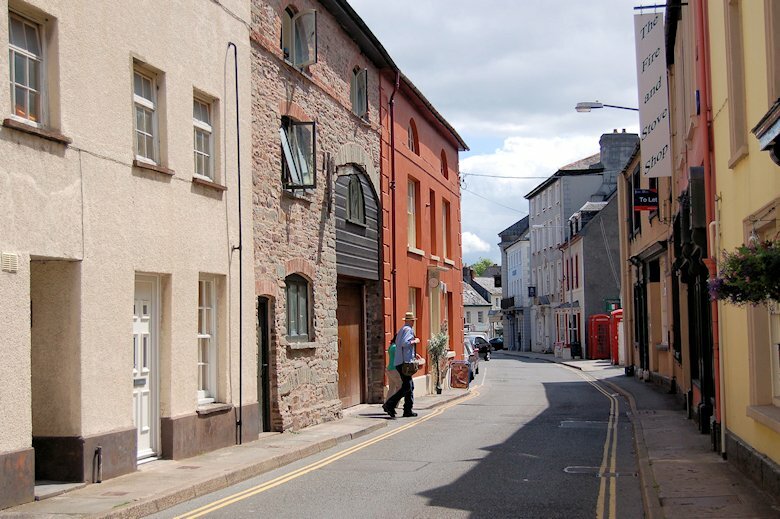 The lane known as Lion Street, parallel to Brecon’s main thoroughfares of High Street and the Bulwark, was once home to an old coaching inn, the Golden Lion (long demolished). At its eastern end is the historic Plough Chapel where Welsh Independents once worshipped. Plough Chapel now belongs to the United Reformed Church. 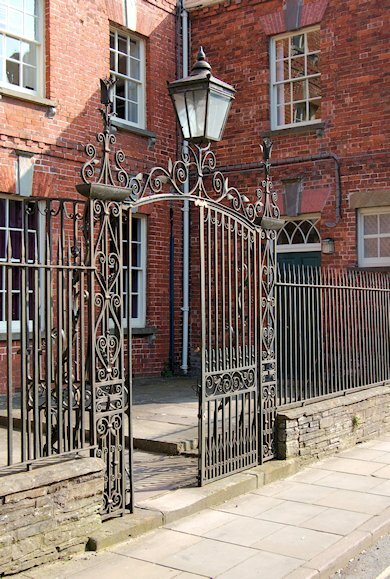 Ornate iron gates and railings protect the entrance to No 4 Lion Street, an attractive mid-eighteenth century town house. 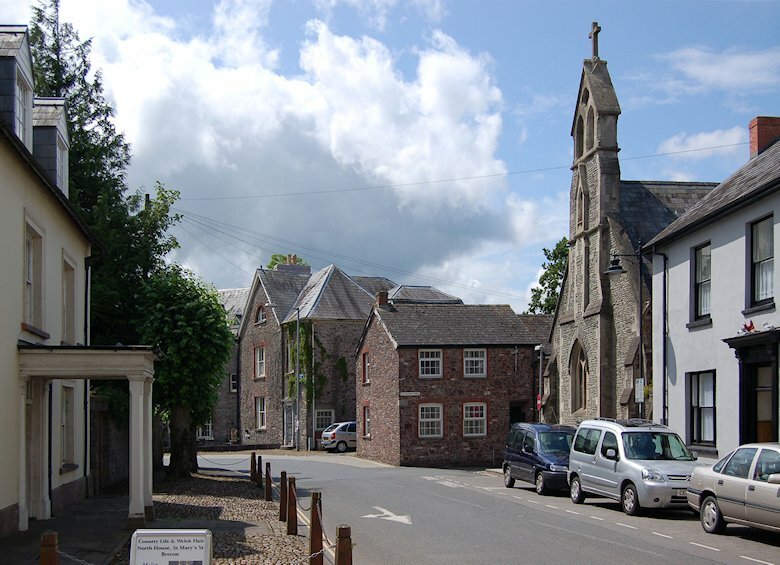 On the left side of Wheat Street is the portico of Ruperra House; in the distance is Buckingham Place, dating from the 16th century, and on the right is St Michael’s Roman Catholic Church, built in 1851. 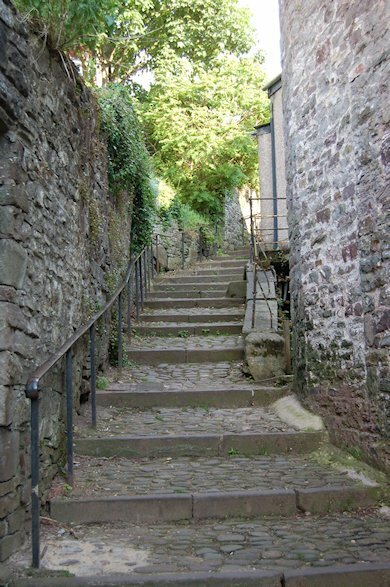 King Charles Steps are a cobbled footway associated with the visit of King Charles I to Brecon in August 1645. The King stayed at the nearby Priory House before marching to the relief of Hereford, then besieged by a Scots army. But whether the King actually ascended the steps is another historic matter entirely! French onion seller pedalling his wares. 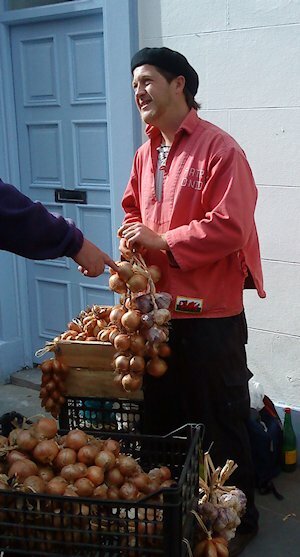 Like many Welsh towns, Brecon is visited several times a year by a traditional onion seller from Brittany, together with his bicycle, weighed down with strings of onions. Breton, the language of Brittany is very similar to the Welsh language, to the point where Bretons and Welsh speakers are said to be mutually intelligible. 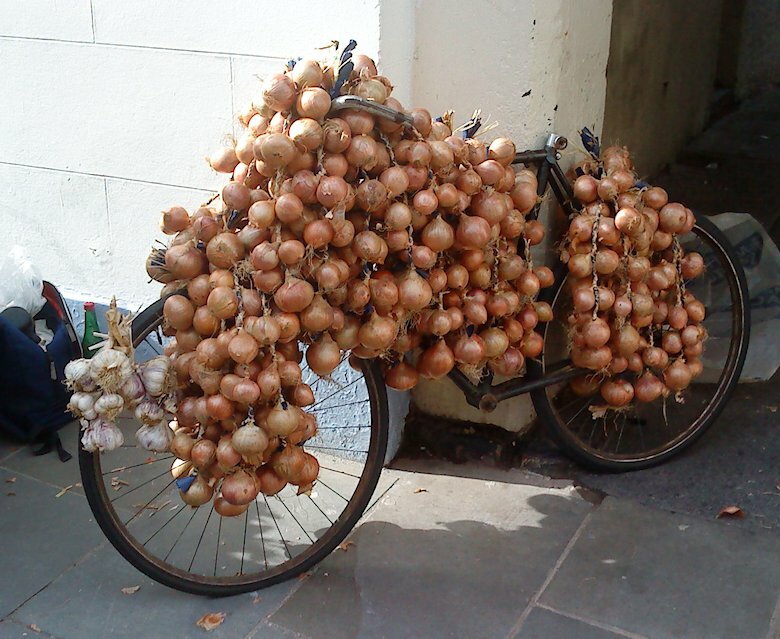 The onion seller’s bicycle appears to have a flat front tyre! 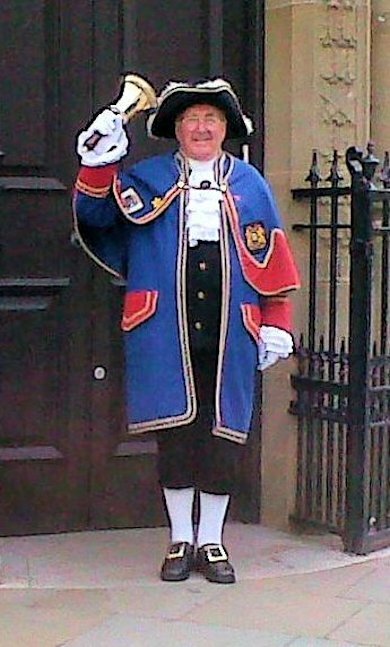 A popular figure in the streets of Brecon on market days is the colourfully dressed town crier. Regular markets are held on Tuesdays and Fridays, but farmers’ markets, craft markets, antique markets, and other specialised markets are held on Saturdays. The raised stage of Brecon’s market hall is also used for musical events (see below). 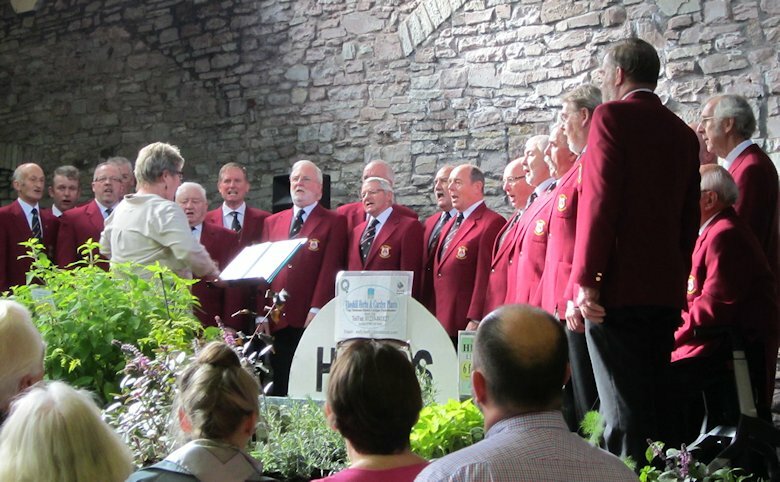 A Welsh Male Voice Choir entertains the crowd in Brecon’s indoor market hall. Brecon is located in the Usk Valley, where the river Honddu flows into the Usk. Both the Usk and its tributary the Honddu respond quickly to rainfall at their sources. Heavy rain in the Brecon Beacons causes the Usk to rise rapidly, while heavy rainfall on Mynydd Epynt causes the Honddu to respond. The images below show the rivers at different times of the year. 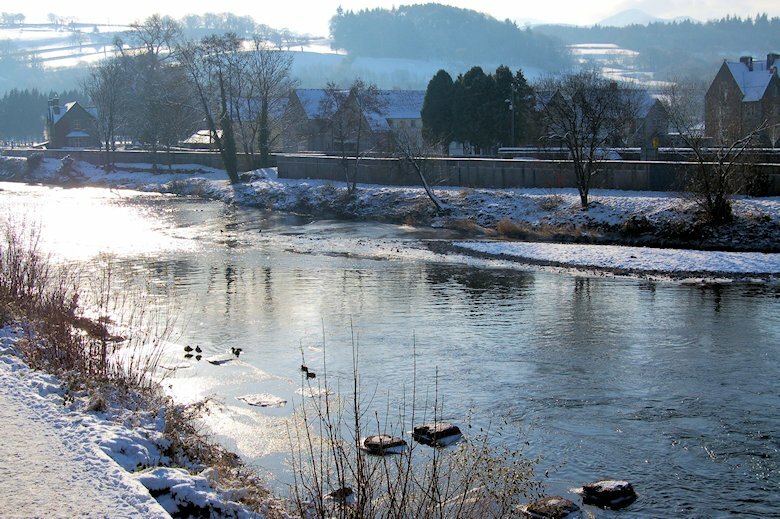 The River Usk on a frosty morning in January 2010. The Usk in the summer of 2009. The bridge over the Usk was built in the 16th century. Overlooking the Usk Bridge in the picture above are the remains of the early 12th century Brecon Castle, built by Bernard Neufmarché, one of William the Conqueror’s barons. The white-painted building alongside the castle is the Castle of Brecon Hotel. 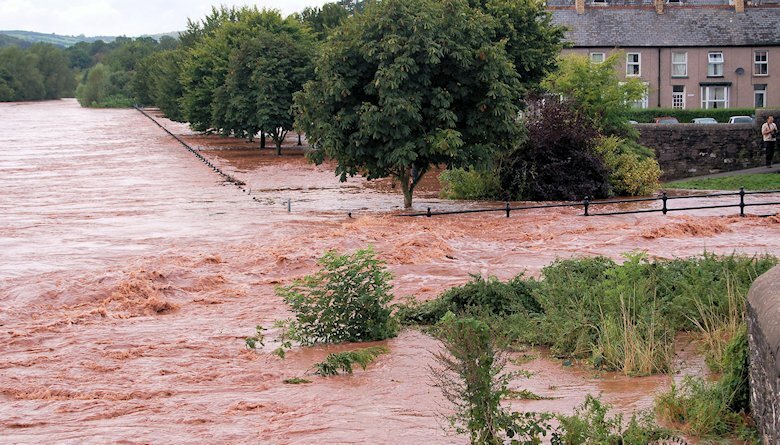 The photograph below shows the Usk at its most awesome, after heavy rains in September 2008. On the right, the waters of the Honddu are flowing into the Usk creating a dramatic turbulence of waters, stained red by the local old red sandstone. 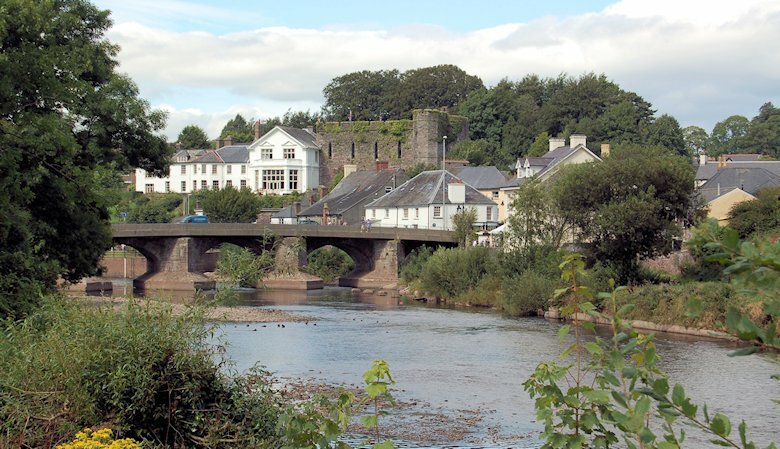 Sadly, it is not unusual for a life to be lost in the Usk when it is in such a mood. The Usk (left) is joined by the waters of the Honddu (right). Both rivers have overflowed their banks. In addition to the rivers Usk and Honddu, Brecon is also served by a canal. The canal, built just over 200 years ago, originally connected Brecon with Abergavenny and with the docks at Newport. Most of the canal is still navigable and provides a wonderful leisure facility. The Monmouthshire and Brecon Canal. This view of the canal was taken looking east from bridge number 166 (known as Gasworks Bridge) in Brecon. 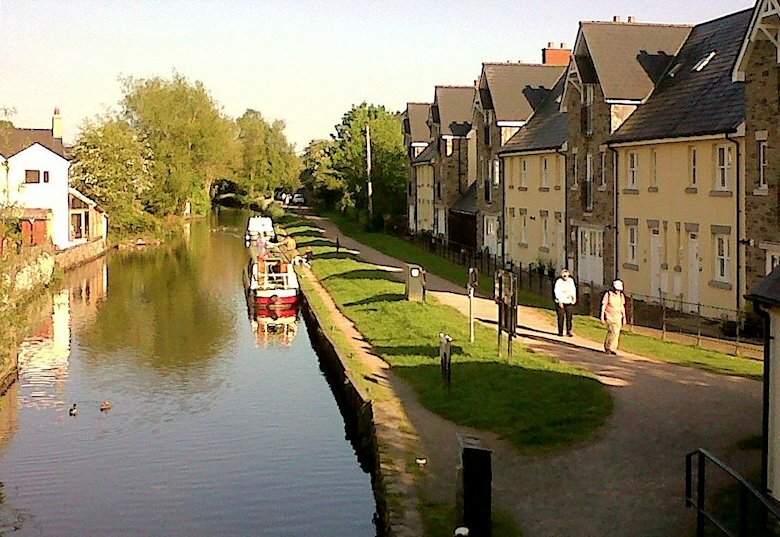 The canal towpath offers idyllic walks through beautiful countryside. The total length of the path is 35 miles. It is always worth keeping one’s eyes peeled and one’s camera at the ready when exploring Brecon. These four shots are just a sample of the subjects one may encounter. The fellow on the right stands outside the Say Cheeze photographic shop in Lion’s Yard, Brecon. A year or two ago, he was stolen but the owner gave chase and recovered the figure shortly afterwards, in pieces and beyond repair according to a local newspaper report. Thankfully, the rumour proved incorrect, and he was soon returned to his rightful place, good as new, outside the photographer’s shop! The figures below are two of a collection of gargoyles pulling faces at passers by descending Priory Hill. They are mounted high on a wall encircling Brecon Cathedral close. 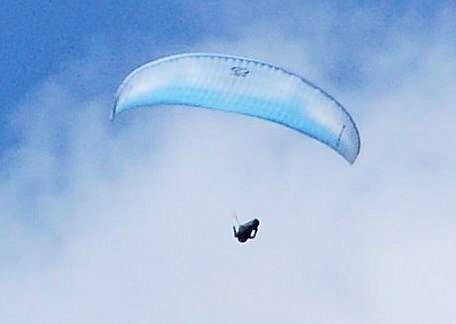 Hang-glider over Brecon (July 2014). A few days ago, on 11th July, an intrepid hang-glider (right) circled over Brecon, presumably seeking a convenient thermal. He remained in the skies over Brecon for a good half hour, gradually drifting southwards, before gaining height and eventually disappearing from view. Brecon’s military associations go back a long way. The original Watton barracks, constructed of red brick, were built in 1805 and then extended in 1813. It was from here that troops were despatched to the Battle of Rorke’s Drift during the Anglo-Zulu War in 1879. A keep, for the storage of arms and ammunition, was added to the barracks in 1879. The barracks became the home of the South Wales Borderers from 1881 and the South Wales Borderers Museum opened at the barracks in 1935. The barracks were designated as a Regional Seat of Government during the Cold War. They are now the home of 160th (Wales) Brigade. Military parade down Priory Hill (February 2009). The townsfolk of Brecon appreciate the regular military parades that take place through the streets. In many instances the soldiers wear colourful ceremonial dress (above), while on other occasions regular uniform is worn (below). 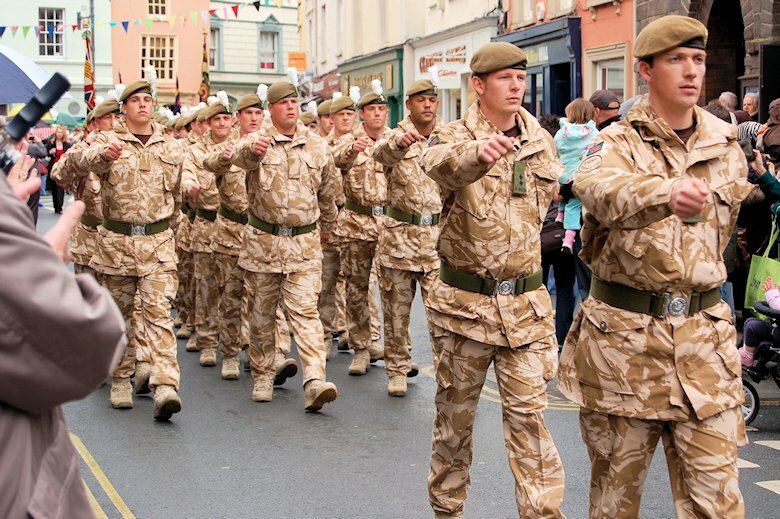 Welsh soldiers march through the streets of Brecon on their safe return from duty in Afghanistan (May 2010). The troops proudly wear white hackles attached to their berets. Since 1939, Brecon has been the home of an Infantry Battle School. In 1961 the Parachute Regiment formed a battle camp there, which was absorbed by the Tactical Training Wing of the School of Infantry in 1976. The School was further redeveloped in 1995. Training is provided for officers, warrant officers and non-commissioned officers by instructors who are rated in the top third by the British Army. A company of Nepalese Gurkhas has been based in Brecon since 1980. Originally known as the Gurkha Demonstration Company, they were awarded freedom of the town and held their first Freedom Parade in 1986. Many of these brave soldiers and their families have made their home in Brecon and contribute greatly to life of the local community. The company of Gurkhas in Brecon currently comprises sixty soldiers and is known as the Gurkha Wing (Mandalay). 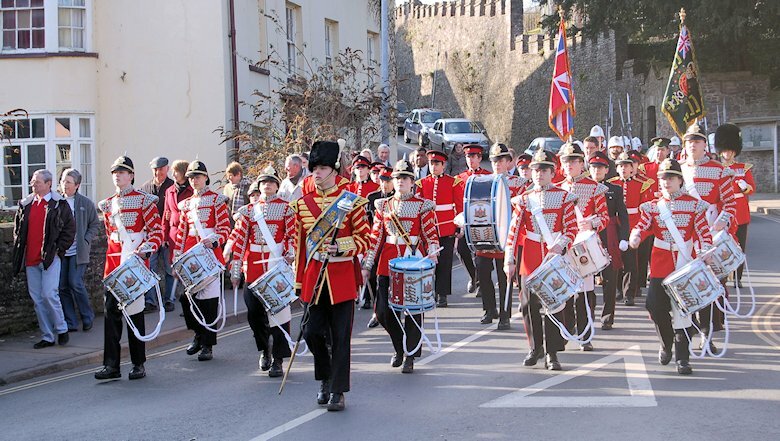 Everyone looks forward to the annual Freedom Parade held in the town centre in July (below). 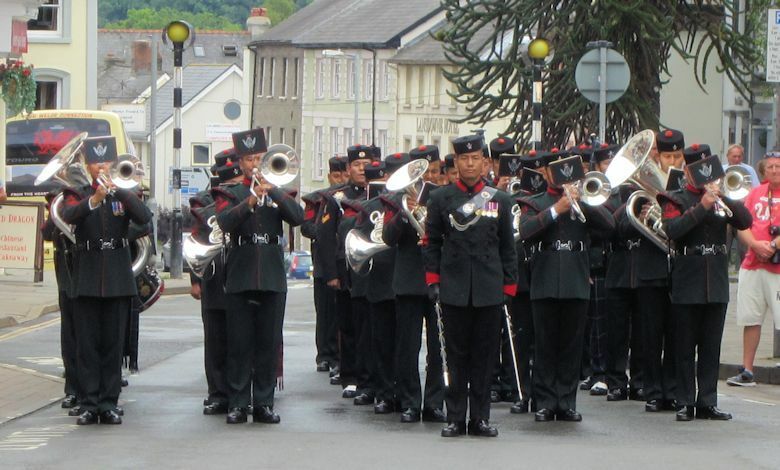 The Band of the Brigade of Gurkhas at the 28th annual Freedom Parade (July 2014). 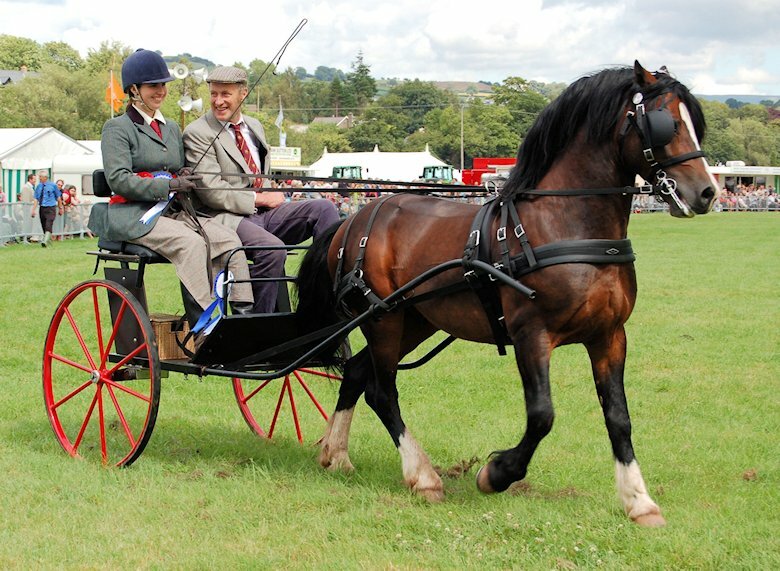 Each year, early in August, the Brecknockshire Agricultural Society (established 1755) holds the Brecon County Show on the eastern outskirts of Brecon. The show includes competitions for livestock and horses, displays of local produce and crafts, and the latest agricultural equipment. Participants in the parade of pony and traps (August 2008). In 1984, the jazz and blues singer, critic, writer and lecturer, George Melly, was asked to help start a jazz festival in the town and cheerfully exclaimed that they could easily turn Brecon into New Orleans for a few days. George Melly loved the area in and around Brecon, whether he was fly fishing in the whirlpools and eddies of the River Usk or pootering around the country lanes in his moped, especially if he was singing at the jazz festival. Melly took his moped test in Brecon three times (on the second occasion running over the test inspector’s foot and taking him to the pub afterwards) and was amused one year to be invited to judge the ‘Miss Moped Wales’ contest. 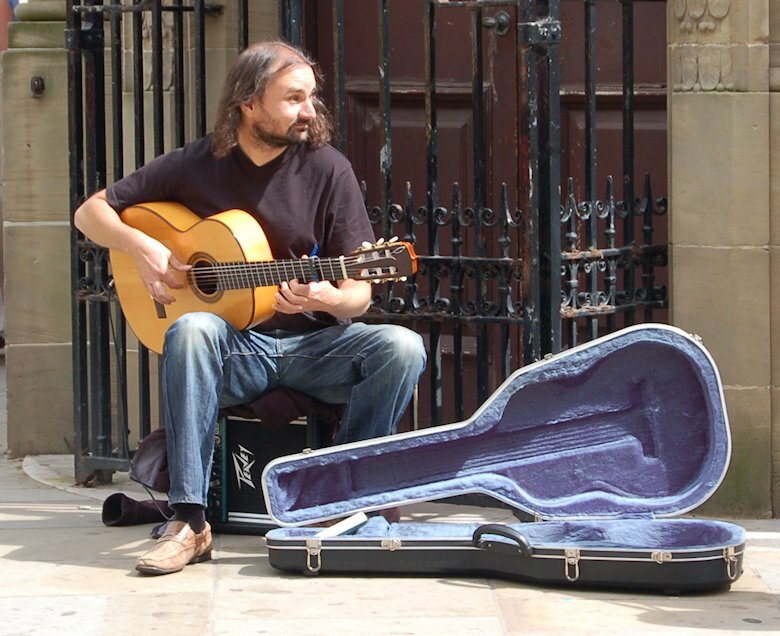 Impromptu performance outside the HSBC bank in High Street (August 2009). 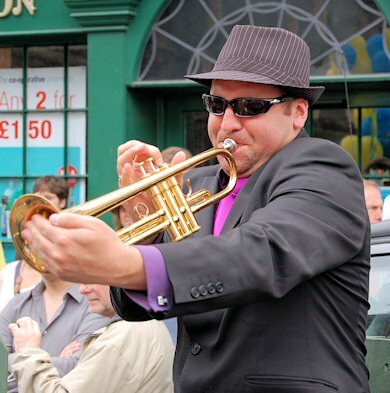 George Melly died in 2007, but the Brecon Jazz Festival lives on, with performances in the main venues such as Theatre Brycheiniog and the Market Hall, and less formal performances in local pubs as part of the Brecon Fringe and in the streets of the town. A jazz parade through the streets of Brecon is held on the Sunday morning of the festival. Trumpeter on one of the floats in the Jazz Parade (August 2010). We have shown you just a taste of ‘our town’ of Brecon. But there is much more to Brecon than this. Why not come and see for yourselves!